Cakes n Cream Dessert Parlor is a beautiful restaurant in Branson where the 1950s era come alive with great food and good music. The sweet treats offered by Cakes n Cream are the nice things that visitors are longing to try as they can help beat the summer heat these days. The moment you step into this great restaurant in Branson you feel as if you have been transported back in time when you hear the music from the antique Wurlitzer jukebox. One of the reasons why visitors flock to the restaurant is because of the sweet treats they serve which include pies, cobblers, and cakes which are all made with fresh fruits. Cakes n Cream also serve soda fountain with dozens of flavors to choose from and about fifty flavors of ice cream that are sure to give you a delicious taste as well as the famous banana splits. 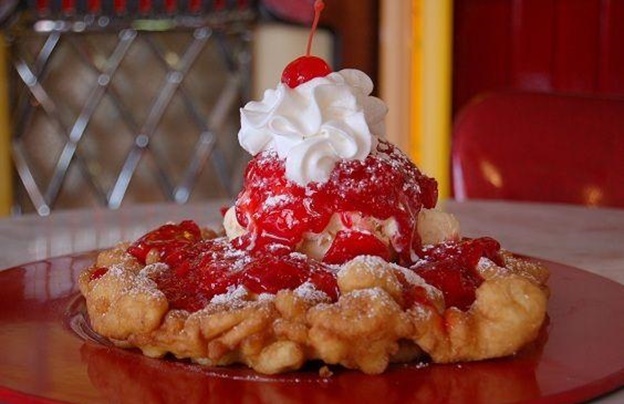 If you are in the mood for delicious treats to satisfy your sweet tooth in a fun atmosphere head out to the Cakes n Cream restaurant in Branson. In this dining place, you will be delighted to see posters of James Dean and Elvis that are adorned on the walls and Bubble Wurlitzer Jukebox that can play up the hottest top songs of the 50’s. Many of the people today still love and intrigued by the music of the 50’s, and the Cakes n Creams restaurant in Branson uses this style as an advantage. Guests to the restaurant are sure to reminisce the past when they see chrome stools, chairs and railings with metallic-flaked material covering the chairs and booths that help enhance the memories of the 50’s. The customers can easily recognize the unique design and delightful decors of the restaurant that help make the place create a nostalgic atmosphere. The important part of the restaurant is the 45 records of the 50’s that are used as accent pieces. The Wurlitzer Jukebox is a trademark of Cakes n Creams which has a special place in the restaurant, just as it was patronized in the soda shops in the past. Even up to this day, there are still music enthusiasts who are attracted to the songs played in the Jukebox. Neon is also an important décor of Cakes n Creams as it brings the memories of the past to any place you put it. It also brings a colorful glow of light throughout the whole restaurant that help create great ambiance. Cakes n Creams restaurant in Branson is committed to serve a quality product with excellent service. The number one goal of the restaurant is to make customer fully satisfied. Whether it is about the quality of food, friendly service or dining atmosphere, making the customer satisfied is an integral part of the success of Cakes n Creams. If you want to try a unique dining experience in Branson, visit the Cakes n Creams Dessert Parlor where the 50’s era come alive with sweet treats and some great music.